Poem of the Day, April 26: Night Light, Kate Barnes | Welcome to the new Journalverse! Pastoral, narrative, deliberately lyrical, the poetry of Kate Barnes is set solidly in the rural Maine countryside, and in the literary tradition in which she was raised (her father was Henry Beston, her mother Elizabeth Coatsworth). There she lives near the house that Beston made famous in Northern Farm, drawing strength and inspiration from the coastal landscape to steady her through the changing seasons of life. These are poems that examine and celebrate the ingredients of our humanity: friendship and wonder, loneliness and endurance, sexuality and unrequited longing, familial ties and the overriding relationship of the individual to nature, to landscape and animals, and to the living earth itself. 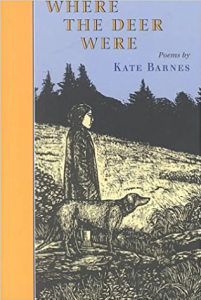 Kate Barnes spent her childhood in Maine and Massachusetts, and now lives on a farm in coastal Maine. Her poetry has appeared in numerous publications, including Harpers, The New Yorker, The Village Voice, New England Review, and Harvard Review. Buy Where the Deer Were here. it is my dog on the floor; we are both alive here. 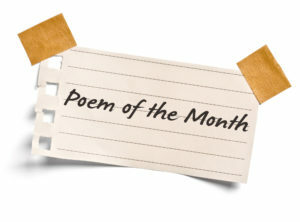 Write a poem about the light you find in darkness. Choose a color and write a poem about its many nuances.